What is it that attracts your initial interest in a new recipe? Way before your final verdict on the results, what triggers your culinary hunting skills? I can’t quite pin point it down, no rule of thumb, no blanket conclusion. What sometimes does it for me is an unusual pairing of ingredients, or perhaps the author’s captivating writing style. Rave reviews can also subserve to achieve the benefit of a doubt and make me head into the kitchen and just do it. But above all that, a nice picture never fails to seduce me! Spotting Mav’s cookie recipe (herself inspired by Camilla), the sloppy piles on my desktop all of sudden became less important… Christmas cookie baking was overdue! Totally overdue. 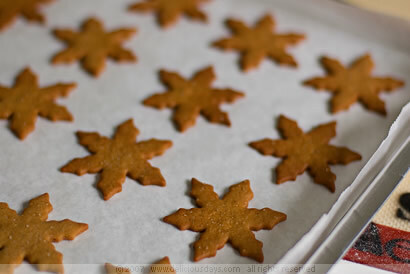 My annual routine has already been messed up, for the first time really – no curd stollen, no chocolate coconut cubes, no blackberry smacks, no vanilla crescents started off this years’ baking marathon, instead the Pepparkakor (Swedish Christmas Ginger Cookies) rang in the season. And what a worthy choice! Not only did I work with molasses dough for the first time, but my kitchen was infused with wonderful fragrant spices – can you get high on cloves and ginger? I bet you can. Like Mav, I substituted the white sugar with brown one (demerara sugar) and for the molasses I used sugar beet molasses for my first batch and date syrup (Silan) for my second. 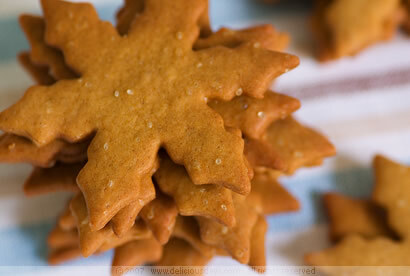 Pepparkakor – definitely a keeper! These are my absolute favorite christmas cookies. My mom has a great recipe, which I think is similar to this one. Once she accidentally used cayenne pepper instead of cinnamon! It actually wasn't so bad- they tasted the same, but had a little kick to them. So cute, gonna make them today. I haven't done much Christmas baking this year and there are still some cookie boxes to fill! Thanks for sharing. They sound Delicious will have to give them a try for Christmas day! I want to know how many cookies come out from this recipe. Fully agreed. Difficult for me to read a Cooking book without any picture. Have a nice day! Try substituting the molasses with honey and maple syrup, adds a different note. Beautiful photography! Great pictures and wonderful recipe!!! Do you think that I could use maple syrup instead of molasses??? I love these cookies...it's the spice that wins me over. Such lovely snowflakes you have created! My sister bakes a similar recipe and it is one of my favorite cookies each year. She sometimes adds a little black pepper, which I think gives an extra kick! Try it! We use them for Christmas tree decoration, just make a hole through them before baking, tie a bow and hang them on your tree. Very pretty! Any volumetric conversions on the first four ingredients for us Imperial types? EDIT Nicky: The original recipe uses imperial measurements and can either be found in my post above or here. I think we have the same cookie cutters!! Thanks so much for this! Your photos are beautiful. I've been looking for a well-tested recipe for these treats. Now I know what I'm baking this weekend! Gorgeous shapes too . . .
My father bakes similar cookies every year (danish version: brunkager) which has almond slices and orange peels in it as well. No matter your choice of variation over these lovely spicy cookies the truely fantastic thing is that you can make a huge batch and just keep it in the fridge, thightly wrapped in clingfilm, and bake a tray or two when you need the house to be filled with the fragrance of cinamon, cloves and ginger! Ahh. Yes, you can surely get high on this stuf! Hi, these are beautiful. I've had an imported version of these and wondered if I could find a similar recipe. Can you tell me - do you use a cookie press? I've only just discovered they exist. They look like they're easier than using a cutter but I'd like to talk to someone who's used one. I can't even find a supplier in Australia so I'd have to order one in (hooray amazon). Lovely! I like the shape! Karolina, Another reader (Kyra) suggested using maple syrup instead, I don't see a reason why it shouldn't work just as well. Ah, too bad I didn't see this before Christmas :(. I guess I'll make next week-end all the good recipes I missed for Christmas. Thanks for a yum idea! Nicky, I had prepared the dough a few days ago and baked the cookies today. They are fantastic! Crispy, not too sweet. I had no problems with rolling the dough, it wasn't sticky. 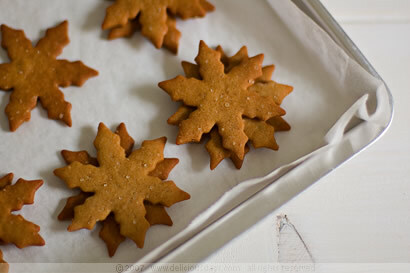 I am a fellow Munich person and also love your website, have made quite a few of your recipes including these biscuits. Flavour was good but I found the texture very soft and chewy. Were yours 'crunchy' or are they supposed to be soft?